CCTV footage shared on YouTube captured the moment a toddler miraculously escaped death when a truck lorry reversed over him as he was playing in the street. 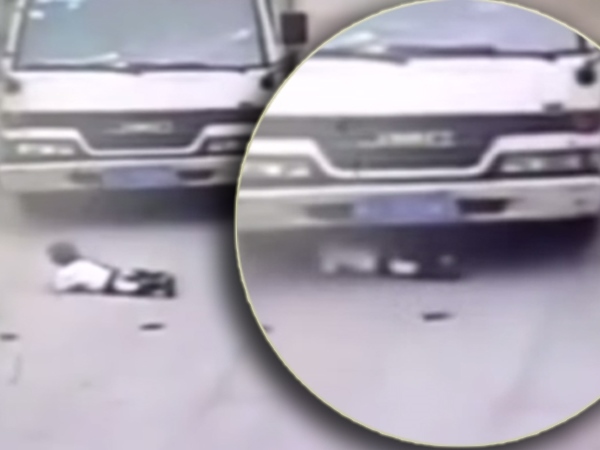 In the video, a truck driver in China can be seen reversing his vehicle over the toddler. Instinctively, the boy lies desperately still and manages to avoid getting mangled under the truck’s wheels. Shockingly, the truck driver drives off without getting out of the vehicle to check on the child. But the youngster gets up and, seemingly unhurt, runs out of the road.